I do not know myself, but check with a friend. Purely by blurry eagles, the chap on the left looks Luftwaffe, & the right SS. Bit too fuzzy for me to make out other insignia though, I'm afraid. Looks to me like a Father and Son photo. Son in new Wehrmacht uniform perhaps as a new recruit. Does not look like a Luftwaffe eagle. Father looks to be in a Gauliter uniform and may have been a prominent member of the community and Party member. HA96 and von Poop like this. Son in new Whermacht uniform perhaps as a new recruit. Does not look like a Luftwaffe eagle. Left ears and noses look alike. Thank you very much for your help. They are father and son and they are my grandfather and great grandfather. My friend confirmed, son is a Private of the Wehrmacht (eagles and belt buckle) father, no comment, but I will challenge him with the assumption: SS. Thank you very much for your help it is very much appreciated. If he was Luftwaffe he'd still be Wehrmacht. Don't forget the Wehrmacht consisted of the Heer, Luftwaffe & Kriegsmarine. Was the Luftwaffe the German airforce? They were both Polish but their surname is of German origins and this was taken in Poland. I wonder if the photograph was taken before the war or during the war. During the war there were many Poles who were deemed by their Germanic surnames to be ethnic Germans, who after Poland was overrun were pressed into German military service. Was the Luftwaffe the German airforce? . Thank you all for your help. The picture was taken during the war. Not an expert on German uniforms but don't think the tunic style is Luftwaffe. 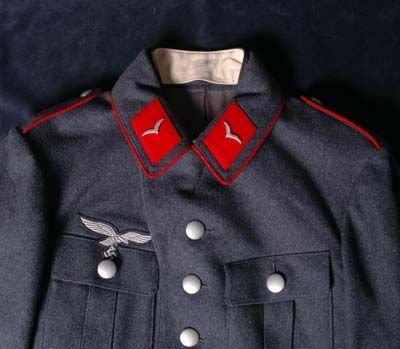 Luftwaffe had an open collar tunic with other ranks tending to wear a blouse that did not have breast pockets. The eagle does not look like the drooped wings of the Luftwaffe either. I'd say army for man on left and some civilian or Nazi party organisation for older man on right. Sorry should have said `army` rather than Wehrmacht . Luftwaffe tunics could be worn closed or open I was thinking along the lines of the 5 button 1938 Tunic? No problems though just throwing in an opinion. Hard to tell from a small image but the style of jacket worn by the troops on the left of this photo seems a good match?